Sanford and Son Junk Cars is Berkeley Lake’s instant cash for junk cars resource. We pay cash for all your junk car’s, truck’s, van’s, suv’s and trailor’s! We can even assist with removal of abandoned vehicles, most Boats, and RV’s! Call today and trade in your junk for quick Cash! Get rid of those old junk vehicles today. We make it easy. Why wait for local law enforcement agencies to fine you and tow your vehicle? Forcing you to pay when you can GET PAID CASH! Why junk your car with Sanford and Son Junk Cars? For a typical vehicle about 75% of the parts are salvaged for reuse, about 20% of the vehicle is recycled, and the remaining 5% is thrown away. This makes recycling vehicles one of the greenest products on the planet! Cash in your junk car the eco-friendly way with Sanford and Son Junk Cars by calling 770-771-9494 or submit your vehicle information right now by using our free online quote form. 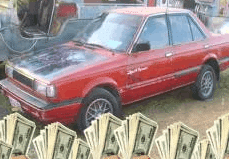 Your Cash for Junk Car quote in Berkeley Lake is just minutes away! It usually only takes 2 or 3 minutes to get a value for your car. Is there a clear title?